On 13 December, Steffen Bilger, Parliamentary State Secretary at the Federal Ministry of Transport and Digital Infrastructure (BMVI), handed over the notification of funding approval amounting to around 7.5 million euros to the partners of the "Delfin" fuel cell project. The Institute of Plastics Processing (IKV) in Industry and the Skilled Crafts at RWTH Aachen University is participating in this project with, among other things, its research into an in-line monitoring method for the winding process of pressure tanks. The Delfin project involves the development of a pressure tank with reduced costs and weight for emissions-free hydrogen mobility. The high costs of pressure tanks for hydrogen storage represent a major barrier to establishing such systems on the market. The project is funded within the scope of the National Innovation Programme Hydrogen and Fuel Cell Technology (NIP). For the NIP, the Federal Ministry for Transport and Digital Infrastructure (BMVI) will provide, in the period from 2016 to 2019, 250 million euros alone for research and development and the procurement of vehicles. "This project is a milestone on the path to fuel cell vehicles that will provide customers with the long range they are accustomed to at a marketable price. 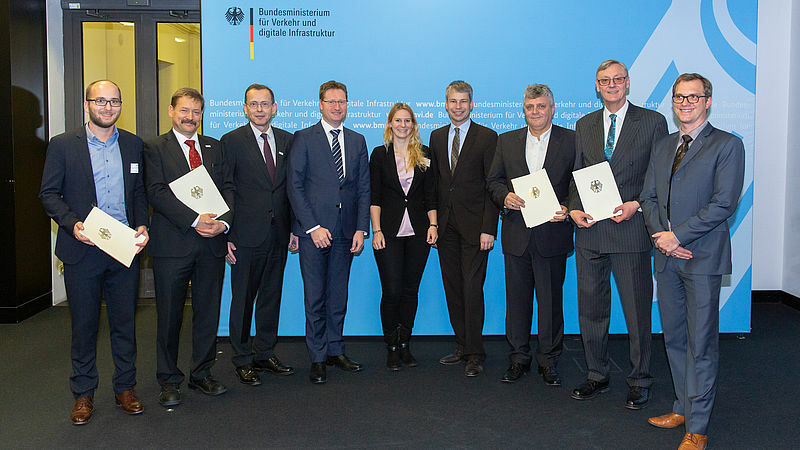 We must continue to work consistently on creating the technological and production conditions for the commercial introduction of fuel cell vehicles in Germany and Europe in order to make the switch to alternative fuels successful on a large scale," said Bilger during the ceremonial handover of the notification of funding approval. The partners in the project, Ford, BMW and NuCellSys, as well as the suppliers, NPROXX Jülich, Elkamet, Tejin Carbon, engineering service provider ISATEC and, on the public side, the Federal Institute for Materials Research and Testing (BAM) and IKV – have joined forces to develop and test innovative design and manufacturing concepts as well as new materials. The composition of the consortium represents the entire value chain of the pressure tank – from the manufacture of the individual components and their assembly to their suitability for use in fuel cell-powered vehicles. The research institutes participating in the project support the various stages of the value chain with their understanding of materials, process know-how and experience in testing.